CARINA DE LOPEZ (UNIT LEAD UX) SPEAK`S AT THIS YEAR NEUROMARKETING CONFERENCE IN ANTWERP on April 19th at 11:30 A.M.. 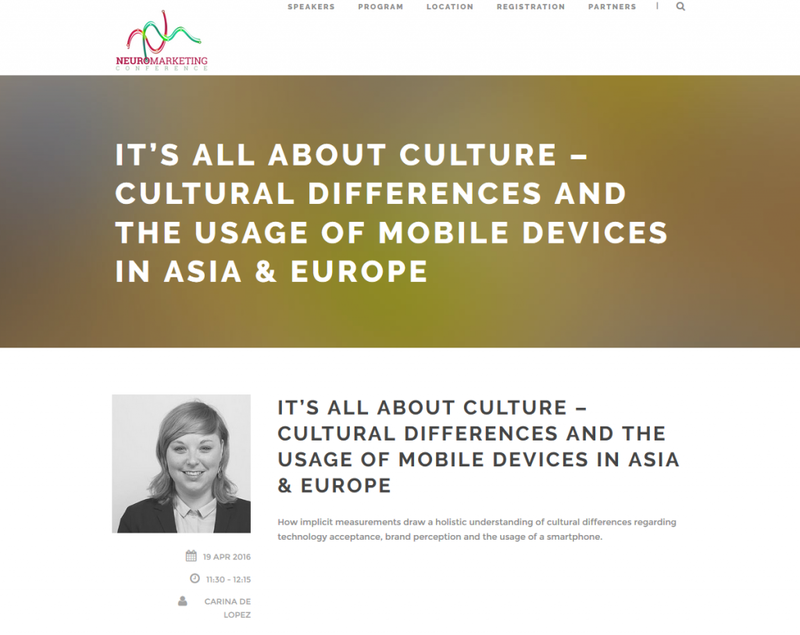 In her presentation “IT’S ALL ABOUT CULTURE – CULTURAL DIFFERENCES AND THE USAGE OF MOBILE DEVICES IN ASIA & EUROPE” Carina explains the impact of cultural influences. By implicit measurements a holistic understanding of cultural differences in terms of consumer acceptance, brand perception and the smartphone usage is explored in further details. Carina de Lopez is an expert in user-centred qualitative methods and responsible for intercultural user experience research at eye square with focus on mobile for many years.